Enter this chilly white space and get a feel what it is like to visit the polar oceans by touching the real ice walls. Visit our VIP residents - that’s very important penguins - living in the Kingdom of Ice. Life thrives in the polar seas, especially when summer comes to each pole in turn. When the ice-covered Arctic Ocean is plunged into winter darkness, the Southern Ocean surrounding Antarctica experiences continual summer light. 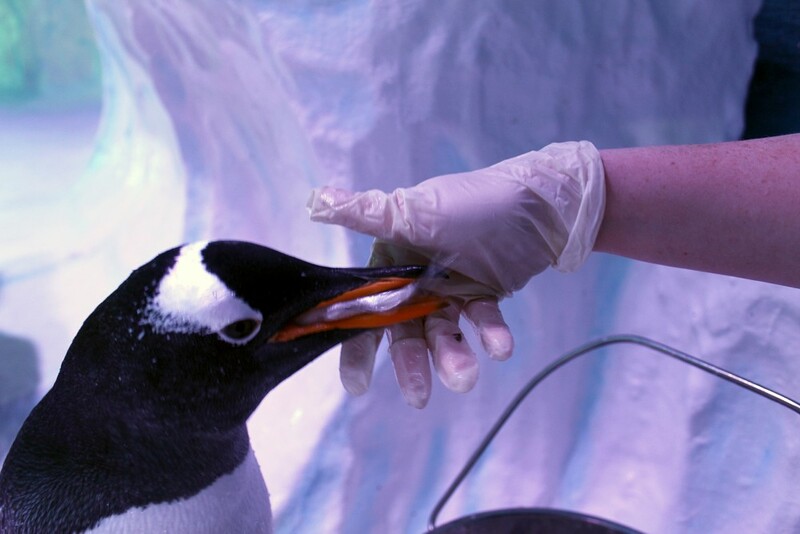 Discover more about global warming, ocean acidification and food chains associated with the animals that live in these colder climes, including Gentoo penguins. With opportunities to view the penguins from different areas, you can enjoy watching them both above and below the water as they gracefully swim and play. The exhibit has been created with the penguins' comfort in mind and boasts climate control and natural lighting cycles to provide essential behavioural cues for breeding and moulting. 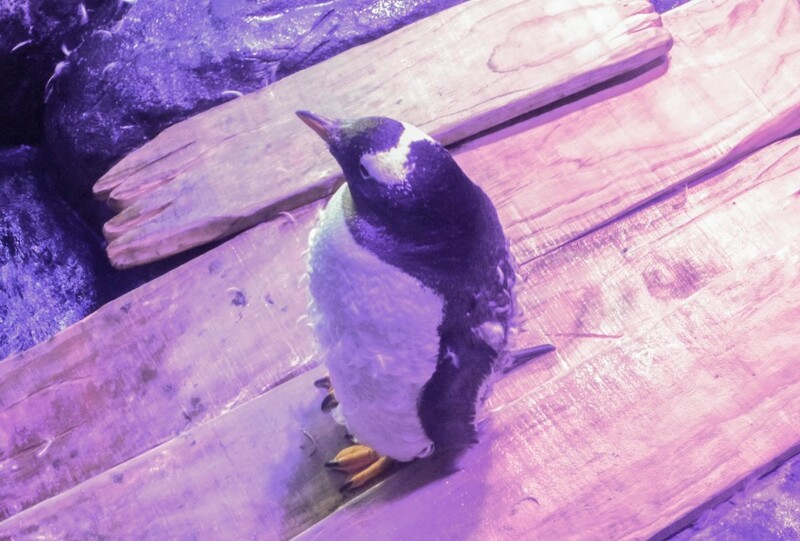 Gentoo penguins live in colder climates in the wild, so their home at The Deep is kept at a chilly 10 degrees C.
Like all birds, penguins moult once a year, but are different from other birds as they lose all their feathers very quickly, rather than just a few at a time. It can often look like a pillow has exploded because their feathers come out so fast, but they need to do this to remain waterproof. Bald patches and missing feathers would let in water meaning they would get cold. Before Gentoos start their moult, they eat more food and put on weight. They then stay on dry land and live off their fat reserves whilst they wait for their old feathers to drop out and new ones push through. 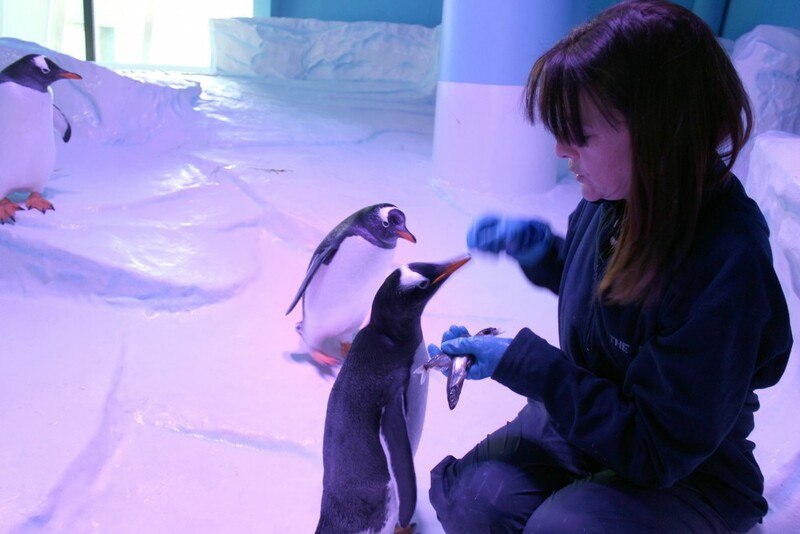 It is important that the penguin enclosure is kept clean, as with any of our other exhibits. Penguins produce a lot of waste, which is bright yellow! This has to be cleaned off their rocks every day and so you may well see members of staff in there scrubbing and hosing down the exhibit. Penguins love to play and believe it or not enjoy nothing more than chasing bubbles and reflected light as well as playing with toys and standing under water sprinklers. 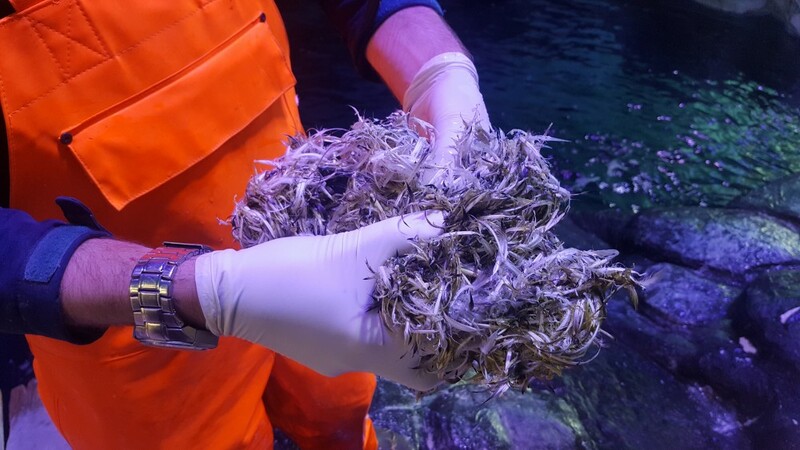 Like with all other animals at The Deep, providing enrichment for the penguins is part of The Deep's everyday work and helps keep the animals healthy. By tuning into their natural behaviours, the keepers can make sure their physical and mental needs are being met. You will be able to watch some of these enrichment activities throughout the day when you visit. Our penguins arrived in two groups; the first from Moody Gardens, Texas in 2014, followed by a further group from Calgary Zoo, Canada in 2015. They now form part of the European Breeding Programme for Gentoo penguins, adding to the genetic diversity of this species in Europe. In this section you will find the answers to some of our most commonly asked questions. The health and happiness of our penguins is our number one priority, so here are some of the ways in which we care for them. 1. How much space do the penguins need? Our exhibit was meticulously designed to ensure that we provide exactly what our Gentoos need. It took 2 years of careful planning and design to ensure that the penguins are comfortable and happy here at The Deep, which is our number one concern. It was built using the American and European penguin husbandry manuals which provide information on suitable land area, surface area of water and volume of water that you need for different species and for different numbers of birds. We also took advice from a number of penguin experts both in the UK and abroad. This meant building a climate controlled enclosure with a specialist recirculating filtration system for the air and water. The theming of the enclosure has also been designed to give an interesting and enriching environment for the penguins and includes a number of different stimuli for them. 2. What do penguins do for fun? Penguins are very easy to keep happy as they are naturally inquisitive animals. We are careful when providing enrichment that what we offer is based on the specific requirements of penguins and not on a human perception of what penguins like to do! 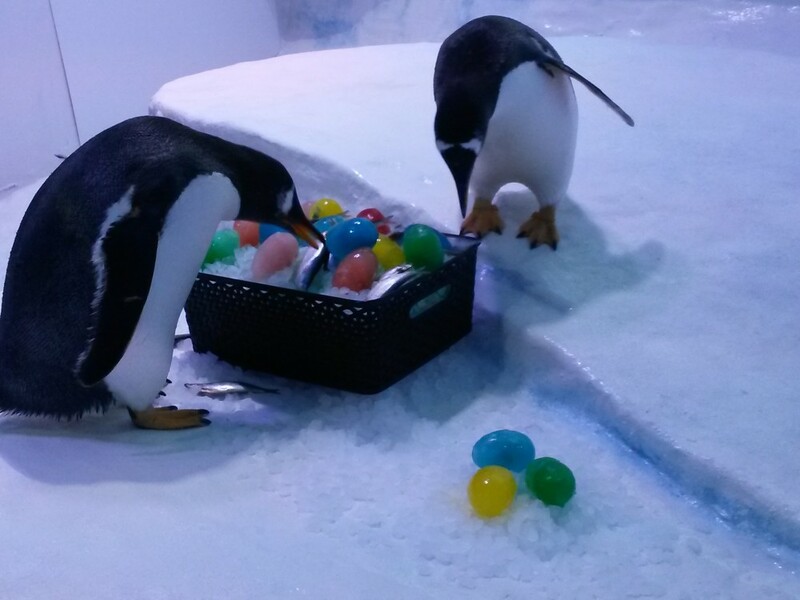 The exhibit itself provides a variety of areas for the penguins to explore including access to ice which builds up in the exhibit throughout the day (which they play with, move, stand on and chase). Different sized and shaped stones in the beach areas encourage natural behaviour in stone selection for nesting material and social interactions. Penguins also favour a variety of textures to walk and stand on. As well as the different terrain you see there are also a range of different textured mats out of view for them to stand or lie down on. If you can't see all the penguins they may well be up there by the window taking a break out of view. The window itself provides views of birds flying past and projected moving cloud images on the walls also act as a visual stimulus. As night falls in the exhibit we have the option to project the southern lights onto the wall which adds slow moving colour. There is also a lot of social enrichment between the animals through natural behaviours (play, courtship, nest building, etc.). In addition, keeper interaction during feeding and cleaning times engages the animals. Cleaning duties involve brushes and hoses which themselves engage the birds. Feeding is offered by hand or via foraging for food in the water or on land. In addition a wide variety of children's toys can be used to introduce changes into the exhibit. Floating objects, balls, bubble machines and coloured objects all provide interest for the birds. The key to good enrichment is to provide different things as randomly as possible, at unpredictable times and for different lengths of time. 3. Why is the display indoors? Gentoo penguins are a Sub Antarctic species of bird and as such enjoy colder temperatures. Our climate here in Hull would be too warm for them in the summer months and so our exhibit has been designed and built with an air conditioning system which also filters the air keeping it as clean and fresh as possible. 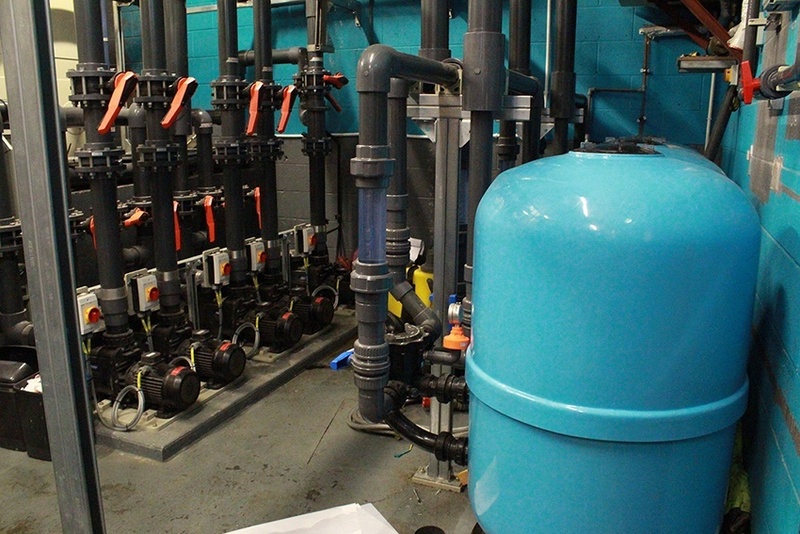 Having an indoor exhibit means we can also chill the water to ensure a natural water temperature. 4. Why are we unable to go inside the penguin exhibit? Our exhibit was meticulously designed to ensure that we meet the penguins' needs and to ensure they are comfortable and happy. Having our visitors go through the exhibit would compromise the climate control and air filtration of the exhibit which would not be in the best interests of the birds. The three different viewing areas give three very different perspectives of the enclosure and allow for the chance to get literally centimetres away from the penguins. They can be seen from above, underwater and on land. Whilst walking through the Kingdom of Ice as you approach the penguin display you are able to get a feel for the penguins' cold environment and touch our real ice walls. 5. Why does it go dark in the exhibit during the winter? The penguins enclosure has a purpose built lighting system which replicates the day length throughout the year in South Georgia. It follows a Northern hemisphere regime rather than a Southern hemisphere regime so in the winter the exhibit will have shorter days like we do in the UK. Penguins rely on day length as a trigger for their annual moult (when they lose and replace feathers). This lighting system means that they get all the right cues to do this properly. 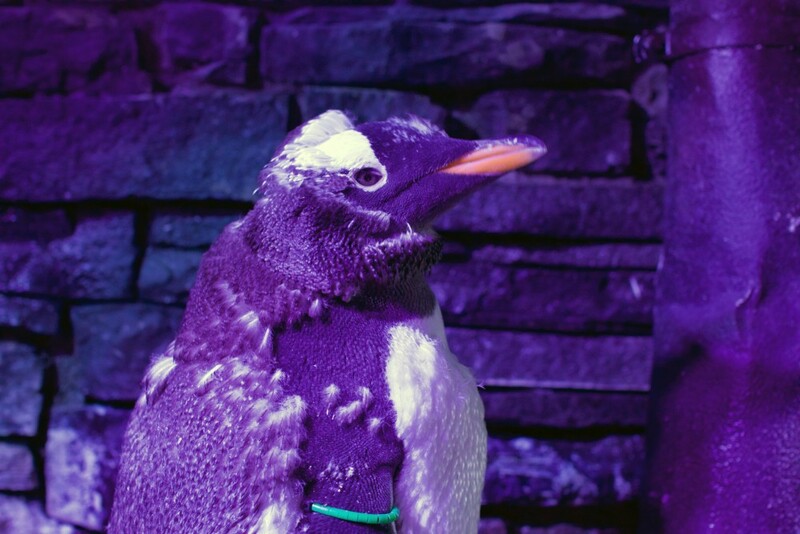 The penguins can still be seen after sunset in the winter months as the exhibit has a moon light. The penguins will likely be less active as they rest during the darker hours. 6. When are the penguins most active? The penguins tend to be most active in the morning and early afternoon and can be seen swimming, jumping and waddling around. Later in the afternoon, their pace slows down in preparation for 'sunset', and they are often seen preening their feathers and resting later in the day. 7. When is it easiest to see the penguins? The Deep tends to be at its busiest between 11am and 1.30pm, so if you would prefer it to be quieter, then we suggest visiting outside of these times. We appreciate the viewing windows can get busy and we don't want to rush our visitors, but please be considerate and let everyone have a chance to see them when you have had a good look. 8. Why do the penguins occasionally look scruffy? Once a year penguins (like all other birds) 'moult'. This is a natural process where they lose and regrow their feathers. It can take a few weeks for the process to complete but during this time they can appear scruffy and inactive. In the two weeks before the penguins moult, their appetite increases and they eat more food in preparation. Gentoos have two types of feathers; a soft downy woollen layer to keep them warm and a waterproof layer on top to keep them dry, and during the moult these are lost. Penguins will therefore spend much more time on land and are generally less active. Here you can see some of the stars of Kingdom of Ice, so make sure to look out for them on your way round. Brian is a reserved boy who likes to do things at his own pace. He is a determined character and our oldest penguin. His birthday is on 30th December and wears a yellow and black band. Rapha is one of the quieter penguins and is a little shy when it comes to food. He holds back until the other penguins have eaten and can be quite picky with what he fancies! His birthday is on 23rd November and he wears a white band. Stanley is a cheeky fellow who has a funny habit of tilting his head on a side when eating. He is one of the youngest penguins and enjoys digging for sprat inside ‘ice castles’. His birthday is on 9 December and he wears a purple band. Viola is a bit of a grump. She pretends to bite the keepers but likes affection really. She will let the other penguins know when they are doing something she doesn't like! Her birthday is on 11th December and she wears a black band. Weston is one of the most cheeky and inquisitive penguins. He loves to swim and explore. His birthday is on 10th December and wears a green band. Leo is a cheeky chappy and very confident fellow. He likes lots of attention from our Aquarists and is always the first to come and say hello in the morning! His birthday is on the 14th December and he wears a blue band. Diane is a sweet girl who likes swimming and enrichment toys. She was named after the lady who cared for her in Texas before coming to The Deep. Her birthday is the 6th December and she wears a pink band. Guinevere is bright and friendly. She loves swimming so can often be found in the water. Her birthday is on 8th December and she wears an orange band. Kyla is a sweet and quiet girl who enjoys lots of preening and a spot of swimming when it takes her fancy. Her birthday is on 11th May and she wears a red/yellow band. Nessie is a shy and timid girl who is just starting to come out of her shell. The smallest of our penguins, she has become a real favourite of our customers.Her birthday is on 12th May and she wears a red/white band. Shackleton is an alpha male of the group who does things on his own terms. His birthday is on 2nd December and he wears a red band. Shackleton is partner to Nessie and they have a chick together. Attenborough is the male chick whose parents are Nessie and Shackleton, named after the well known naturalist Sir David Attenborough. He's got a bit of a crazy streak; the little scamp has been caught eating chunks of ice from the penguin enclosure once or twice! His birthday is on 11 June and he wears a black and red band. Lizzie is the female chick hatched from parents Leo and Diane, named in honour of HM Queen Elizabeth II. She's a pretty confident and inquisitive young lady who is also a huge foodie! Her birthday is 18 June and she wears a blue and pink striped band.